Summer is not over yet! In fact, I think today it is suppose to reach a muggy 90 degrees. Ugh. But, hot or not, don't neglect adding a feminine touch to your ankles. A new (long awaited) collection of Beaded Anklets have arrived at Crystal Allure! 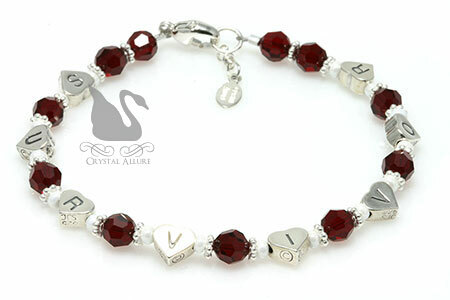 Celebrate summer with one of our handmade sterling silver and Swarovski Crystal anklets. Don't forget to check out the latest beaded jewelry to be added to the Summer Jewelry Collection. You just might find a starfish or two! What's your favorite beaded anklet design? Leave a comment, I'd love to hear from you! Handcrafted beaded anklet features both clear crystal and beach blue Swarovski Crystals, sterling silver spacers, beads and pearlized seed beads. Finished with a summer loving pearlized white Czech shell charm bead and signature jewelry tag. Measures 10-1/4". Handcrafted beaded anklet features beautiful green peridot Swarovski Crystals, sterling silver beads, Bali and chocolate-bronze seed beads. Finished with a double crystal drop charm and signature jewelry tag. Measures 10-1/4". Handcrafted beaded anklet features beautiful pink Swarovski Pearls, sterling silver beads, Bali and pearlized fiber optic white seed beads. The unique finishing touch on this lovely Swarovski anklet is the sterling silver CZ pink dragonfly charm that features a stained-glass style wing. Finished with signature jewelry tag. Measures 10-1/2". 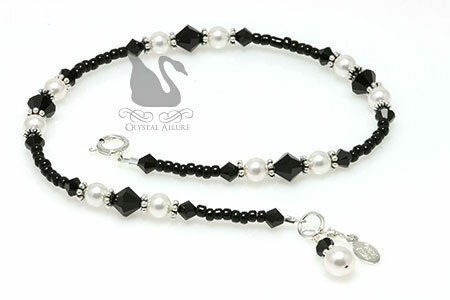 A classic, elegant design suited for any occassion or outfit, our handcrafted beaded anklet features jet black Swarovski Austrian Crystals, Swarovski Pearls, sterling silver Bali and black seed beads. Finished with a double crystal and pearl drop charm and signature jewelry tag. Measures 10". On July 16, 2010, the Wall Street Journal reported New Yorkers' obsession with cupcakes is a driver of the city's economy. The article by Sumathi Reddy referred to them as "little morsels of impossibly cute frosted sweetness" and called the latest rage for cupcakes, "buttercream economics". Hmmm, well... cupcakes are delicious there's no lie there and no disputing it either (okay, maybe the pickle cupcake is going a little too far and I doubt it's very tasty!). And, cupcakes are in essence, little cakes with little prices. But, for me, it's about the design. 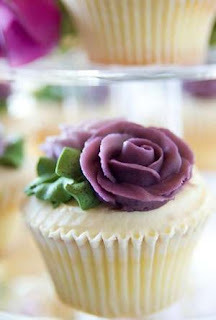 Cupcakes are good, yes, that's the point of them but they are also an opportunity to showcase creativeness. Okay, confession. I LOVE CUPCAKES. I love cupcakes about as much as I love Swarovski Crystals. In fact, on occasion you might find me searching the google images for these petite delicious cakes -the pictures alone are a treat. In preparing this blog post, I came across so many tasty looking cupcakes that I honestly think I was drooling and there were waayyy to many to share. I'm a huge fan of Cake Boss on TLC and watch it whenever I can. I guess I watch it and dream of what could be my own bakery. Although I quickly snap out of it realizing, as I tell my husband, that I could never work in a bakery. I'm quite positive my doctor wouldn't want me to either -the sweets...oh the sweets! The good news (for me anyway...sorry readers) is, just earlier this month I was delighted to hear a new cupcakery, Dollop Gourmet Cupcake Creations, opened up within driving distance for me. Interestingly, I even learned there are two other cupcakeries in my area (Sugar Mountain Bake Shoppe and Dolce Cupcakery) that I never even knew existed (hmmm...might be time for some advertising?). So what do you think -are cupcakes and cupcake cafes' a fad or not? A customer contacted me about the Transplant Awareness Survivor Heart Bracelet (B173-TX) because she wanted to give it as a gift to her daughter, Jeannette. She called me Wednesday morning and needed it no later than Friday. The family was having a get together and she wanted to present the bracelet to her daughter for both her birthday and for her Heart Transplant anniversary. I set her up with a custom ticket on the website with express shipping, which would provide enough time to get the bracelet to her by the deadline. We also discussed customizing the beaded awareness bracelet in red to represent heart disease and because the designer style is from the transplant collection, it was a perfect combination. I wanted to share this with you because not only does Crystal Allure Jewelry provide designer beaded crystal awareness bracelets and jewelry, but also custom awareness jewelry. You can have a unique design custom made for the cause closest to your heart, or you can choose one of our existing designs and we'll change up the crystals to represent your cause. For a full list of awareness causes and colors, please see our Awareness Colors and Meanings Resource Jewelry Article. Yeah! It cooled off just enough this past weekend that I was finally able to get some pictures taken. 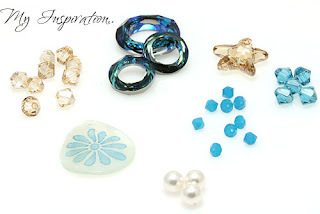 In partnership with the Artbeads Design Partner Blog Program, I received my beads back in May. The theme was Summertime Fun and I immediately thought of incorporating Swarovski Crystal Elements. I also decided on a Lillypilly Shell Pendant that I've had my eye on. My Inspiration: Ocean blues, sandy beaches and natural materials. I chose Swarovski crystal shapes in bicone, cosmic rings, starfish, pearls and a lovely hammershell teardrop pendant. My first thought was to incorporate these bead materials into one or two designs and then I had a dream...yes, I literally had a dream about using these crystal beads in a particular way. One of the other great opportunities of being a Design Partner is my ability to review products. I had not yet gotten into stock any of the "new" Swarovski Crystal Xilion cut crystals -until now. You can see from the picture at left, that the new Xilion cut showcases more facets, more color and more light. Just look at the mirrored image of each crystal bead, the crystal bead on the left (Xilion) shows more points of light than the traditional bicone crystal. Isn't it just fabulous?! So far I have not used the Lillypilly shell pendant in a design yet, but did want to provide a review of it. I was very pleasantly surprised at how beautiful and dainty the pendant was. It will definately work perfectly in a beautiful summer design. My only criticism is that the drilled hole was not exactly centered on the pendant. 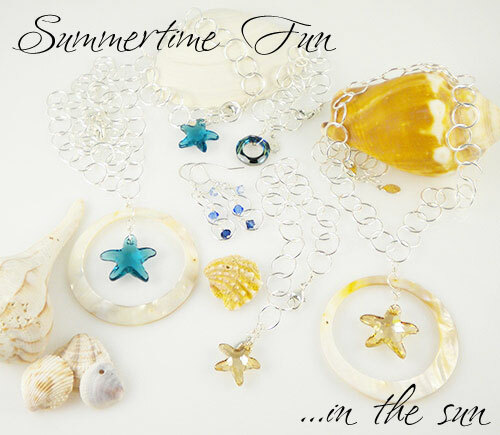 The goal of my Summertime Fun idea was to really highlight the luminosity and beauty of Swarovski Crystals by showcasing each one in its own design. To do that I pulled out some of my personal stash of beads and materials and fashioned the beginnings of a beautiful summer jewelry collection. I also just had to get the new jewelry pieces pictured with a few of my personally collected shells, right from the beaches of Sanibel Island, Florida! When we vacationed years back, I spent just about the entire time on the beach (loved it!) and I'd walk the beach and collect shells. I even brought back some sand! This collection also begins a fresh new start of the crystal jewelry offered at Crystal Allure by going back to its' roots. I'm very happy with the end result because in the summer, I don't like to wear bold jewelry and I personally think by showcasing the crystals on their own, it really makes the crystal stand out. Of course, I did run out of materials (again) and still have some of the crystal beads left. But those new designs will be forthcoming. You may remember the Beauty of Spring Freshwater Pearls blog post. In that post I (briefly) talked about the tools I used to create the Handmade Freshwater Pearl Dragonfly Charm Lariat Necklace (N099) and today, I'd like to expand on them a little more. 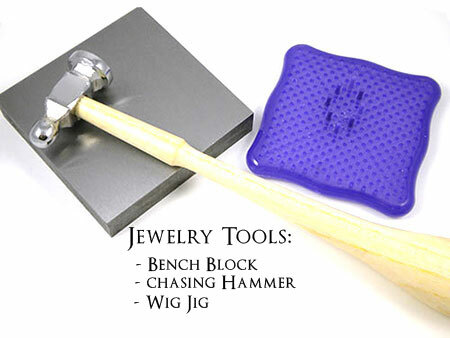 The first tool is a steel bench block. It's quite heavy but the perfect base for flattening, laying out or chasing. The chasing hammer is used to manipulate metal to make it smooth or give it texture. 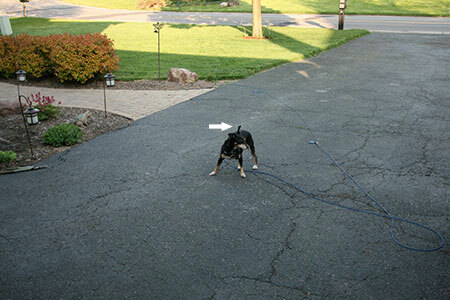 Chasing is a method of decorating metal objects by making indentations with a chasing hammer. The last tool used in this design was a wig jig. An acrylic square with tiny holes drilled into it. You then stick small pegs into the holes and then twist wire around the pegs to form the shape you desire. There are different wig jig's for different gauges of wire. In my case, I picked this wig jig up at the local store probably around the beginning of when I started jewelry design. I just don't remember having used it, until now. The wire "popped" off the pegs a few times and the pegs popped out of the holes a few times too, but it's really an inexpensive jig. As I progressed along in the wire-wrapped necklace, I decided the best finishing touch was to create a lariat style hammered loop using these tools. The end result was exactly what I was hoping for and made me want to use these tools on other designs. 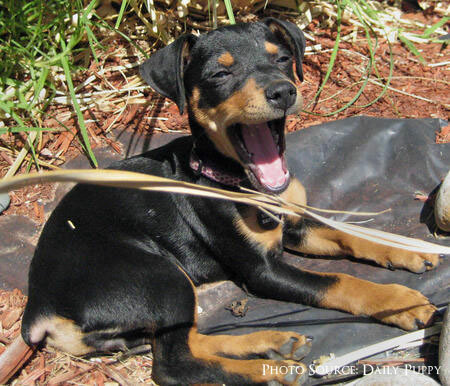 So tell me -have you used any of these tools before? If so, how did you like them?